After some trouble leaving Sri Lanka, we unexpectedly find ourselves with an extra day in the country, and spend it in Negombo, a sizeable city to the north of Colombo, near the airport. 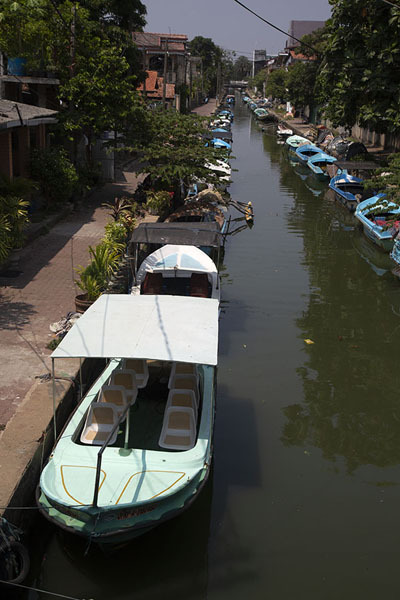 Walking the town, we cross several canals which end up in one of the lagoons. After a great breakfast in a remarkable building, I decide to walk part of the Hamilton Canal, the biggest of the canals. From one of the bridges, I see that the canal is perfectly straight, and both sides have boats docked. The lagoons of the west coast have been connected by canals since a long time: when the Portuguese arrived here in the 16th century, they already recorded the existence of such a network. 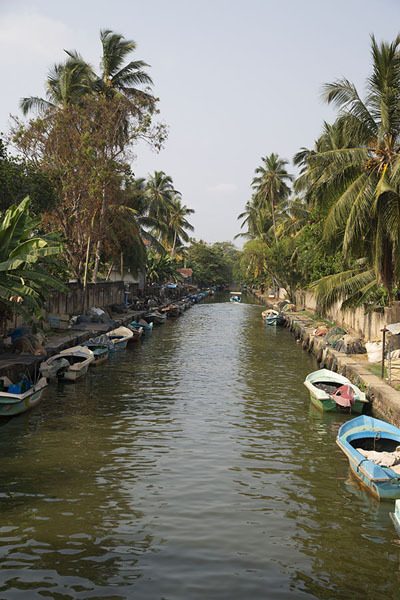 The Dutch then expanded the canals, and dug one which provided transportation of spices, notably cinnamon, to the ports on the coast, while also draining salt water from the rice paddies. 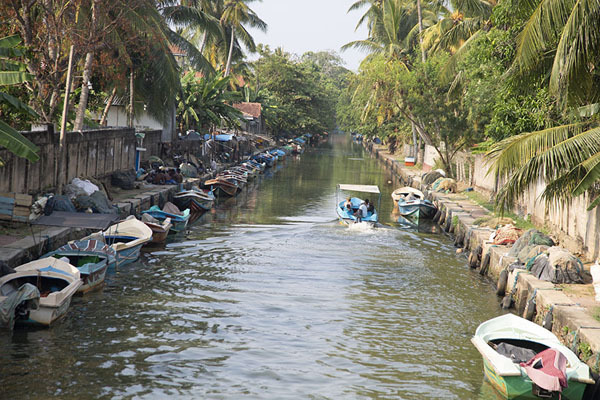 The canal thus became known as the Dutch canal, and it ran for a little under 15 kilometres from south to north, thus linking Colombo and Puttalam, passing through Negombo. 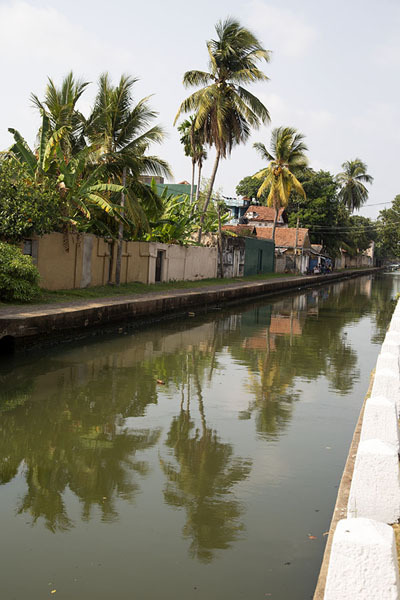 When the British took over at the end f the 18th century, they decided to further enhance the canal. When it was completed, it was named after Gavin Hamilton, the Government Agent of Revenue and Commerce who did not live to see the completion of the canal in 1804 as he died the year before. 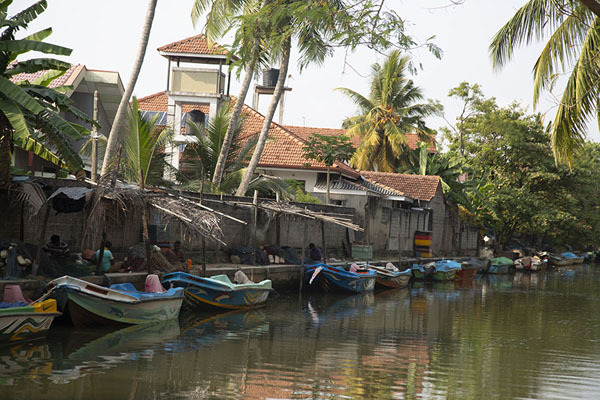 So here am I, walking alongside a historic canal, leaving the bustle of Negombo behind. On both sides, there is a walkway, and there is hardly anyone else around. 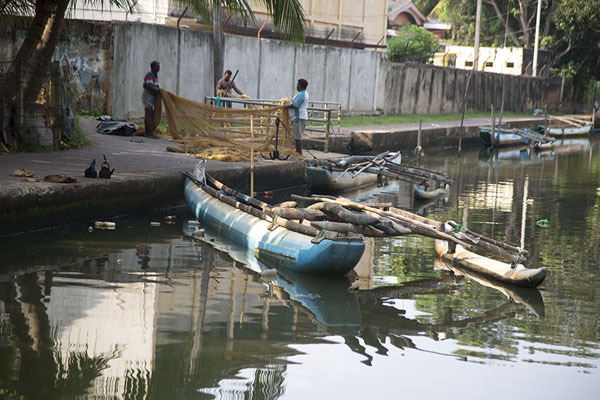 On the other side of the canal, I see fishermen busy repairing their boats, cleaning them, chatting. 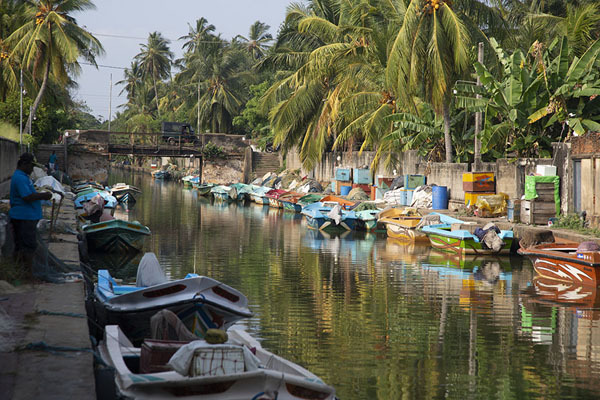 I assume they must use the canal to reach the lagoon and perhaps the sea for fishing. The further I walk, the more fishing nets I see. On my side, the east of the canal, there is no one, probably because it is the sun side. On the other side, there are quite a few people, all men, at work, or playing cards. 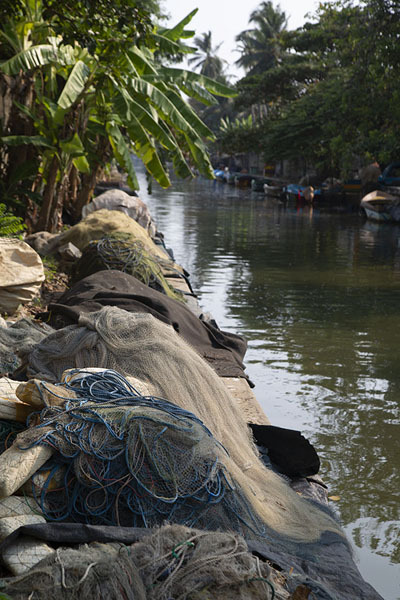 There are always bigger stacks of fishing nets on my side of the canal. When I reach the end of the walkway, I turn back, cross a bridge, and walk on the side where I can meet and greet the fishermen who I have seen before. Unfortunately, their English is not good enough for a real conversation, and my Sinhalese is non-existent: how I would like to hear their stories! Instead, they greet me with a smile, make space for me to walk, grin for a picture. Most of the boats are modern, but some are the traditional wooden outrigger ones. 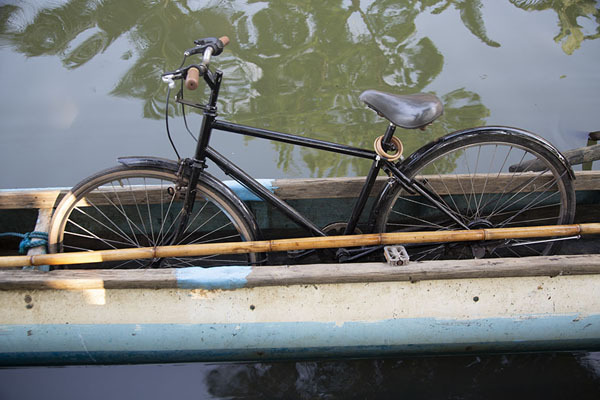 In one, I find a bicycle. The views from this side are better: the afternoon sun casts a warm light on the palm trees hanging over the Hamilton Canal, and the brightly painted boats on the canalside. Personal travel impressions both in words and images from Hamilton Canal (). Clicking on the pictures enlarges them and enables you to send the picture as a free e-card or download it for personal use, for instance, on your weblog. Or click on the map above to visit more places close to Hamilton Canal. 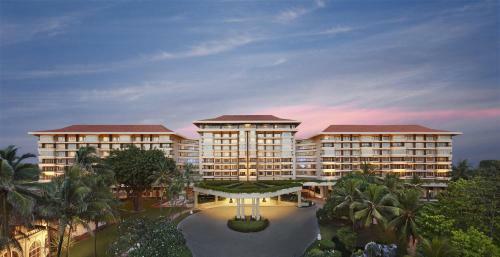 Book a hotel near Hamilton Canal, Negombo, Sri Lanka with low prices for all kinds of hotels - without reservation fees.